Schon seit Langem vertrete ich die These, dass in der nächsten Phase der Krise die Helikopter zum Einsatz kommen werden – das ultimative Mittel zum Vermeiden/Verzögern der unweigerlichen Schulden-/Vermögensdeflation. Entscheidend ist dafür natürlich eine möglichst breite Akzeptanz für das Instrument. Um diese zu erreichen, sind Studien, die den Nutzen zeigen, sicherlich recht nützlich. Womit ich nicht sage, dass diese Studien nicht zutreffend sind. Im Gegenteil, Helikopter-Geld dürfte das letzte verbliebene Mittel sein. „Policy debates have been focused upon the inflationary expectations that may be generated by monetary financing or related policies, consistent with New Consensus Macroeconomics theoretical frameworks. Historical examples of fiscal-monetary policy coordination have been largely neglected, along with alternative theoretical views, such as post-Keynesian perspectives that emphasise uncertainty and demand rather than rational expectations. This paper begins to address this omission.“ – bto: Es wird also untersucht, wie die direkte Staatsfinanzierung in der Vergangenheit funktioniert hat. 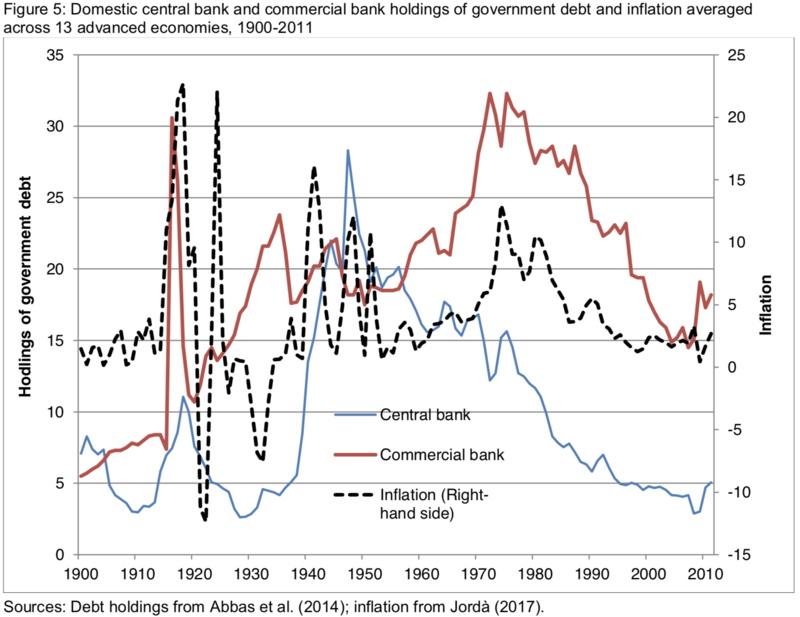 „In particular, we focus on the 1930s-1970s period when central banks and ministries of finance cooperated closely, with less independence accorded to monetary policy and greater weight attached to fiscal policy. We find a number of cases where fiscal-monetary coordination proved useful in stimulating economic growth, supporting industrial policy objectives and managing public debt without excessive inflation.“ – bto: was in der Tat wünschenswert wäre angesichts der Lage, in der wir uns befinden. Es geht doch nur darum, die Schuldenlast tragbarer zu machen. 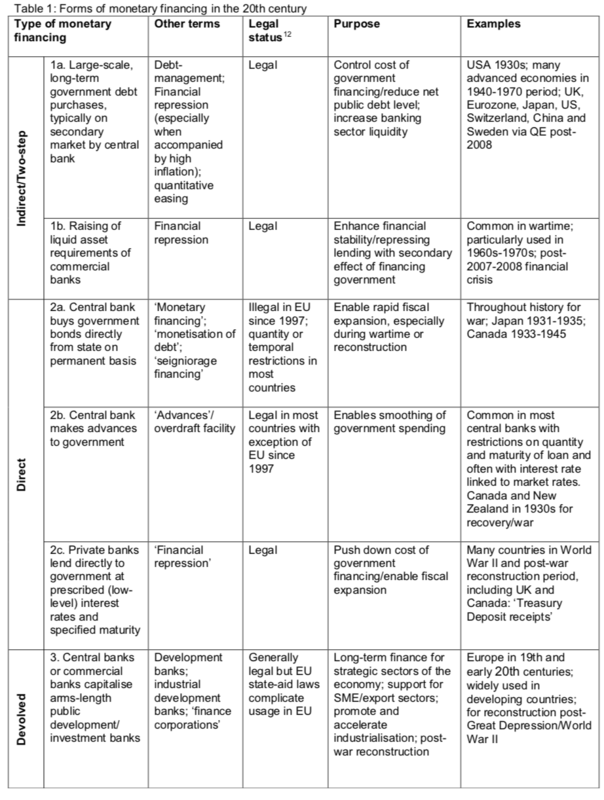 „The prohibition of monetary financing by central banks is a key element of the separation of fiscal and monetary policy that has become crucial to the New Macroeconomic Consensus (NMC), which views inflation-targeting via adjustments to interest rates as the most important activity of the central bank. This framework also prioritises monetary over fiscal policy, with fiscal policy limited to counter-cyclical short-run stabilisation effects.“ – bto: Klar ist aber, dass man mit tiefen Zinsen alleine in eine Sackgasse fährt, in die der Überschuldung, aus der man so einfach nicht mehr herauskommt. Nach 2009 funktioniert es aber nicht mehr: „Despite short-term interest rates being reduced to zero and quantitative easing (QE) programs pushing down the yield on medium and long rates, output growth has remained significantly below the pre-crisis period and central banks have repeatedly undershot their inflation targets. The apparent failure of the standard monetary policy transmission mechanism, whereby the lowering of interest rates should feed through to rising inflation and nominal demand in the real economy, has led to fundamental questions being asked of monetary policy. Meanwhile, public and private debt to GDP levels have remained highas austerity policies have failed to stimulate private sector investment and growth.“ – bto: Es wäre gut, wenn wir endlich offen erkennen würden, dass es eben genau an den hohen Schulden liegt, dass es nicht mehr funktioniert. „The term ‘helicopter money’, popularised by Milton Friedman,has been widely used to describe monetary financing, with the preferred proposal being either a (one-off) tax break or cash handout to citizens or a permanent monetisation of a proportion of the fiscal deficit. The main advantage of such a policy, its advocates argue, is that it would boost demand without adding to either public or private debt levels (…).“ – bto: Das hilft natürlich, wenn man den Nenner schneller wachsen lassen will als den Zähler. „Our review shows that for a large and economically successful period of the 20th century (1930- 1970), monetary financing in various guises was an integral aspect of macroeconomic policy. It was an important means by which governments were able to reflate economies following the Great Depression, finance World War II, and finance fiscal expansion, industrial policy and innovationin the post-war period despite high initial public debt-to-GDP ratios.“ – bto: und das vor dem Hintergrund eines Booms, getrieben aus Basisinnovationen und Bevölkerungswachstum. Was zur Frage führt, ob es in einem gegenteiligen Umfeld auch so funktioniert. Ob es zudem wirklich der Treiber hinter Innovationen war, kann auch gründlich hinterfragt werden. „The historical evidence suggests different forms of monetary financing were not only used during economic downturns, but also more routinely to support fiscal expansion and Keynesian full-employment policies. (…) the current debate (…) neglects the possibility of longer term fiscal-monetary coordination to direct resources into the most productive areas of the economy – with resulting multiplier effects – and stimulate demand.“ – bto: der Traum für alle Politiker! Sie können wieder die Welt retten, indem sie mehr Geld ausgeben. Sodann kommen wir erst mal zum Grundsätzlichen, zur Funktionsweise unseres Wirtschaftssystems, passend zu dem, was auf bto unter Eigentumsökonomik/Debitismus ausführlich diskutiert wurde. Immer mal wieder wert, nachgelesen zu werden. Ersparnisse folgen der Geldschöpfung durch Kredit: „(…) economists following Schumpeter and Keynes have emphasised that capitalist systems are ‘monetary production’ economiesin the sense that investment in the real economy requires financing prior to the existence of savings. Here the commercial banking sector plays a key role as it is able to issue liabilities upon itself to finance new investment for creditworthy borrowers without relying on pre-existing savings.“ – bto: Wer das nicht versteht, der versteht auch nicht, wie die Wirtschaft funktioniert und erst recht nicht, wie es zu Krisen kommen muss. „For stable economic growth, advanced capitalist economies thus require investments that generate profits greater than debt commitments.“ – bto: und vor allem Verschuldung zu produktiven Zwecken, nicht nur für Konsum und Spekulation! Was dann zur Schlussfolgerung führt, dass der Staat und die Notenbank über die Beeinflussung der Gewinnerwartungen erheblichen Einfluss auf die Wirtschaft nehmen können, viel mehr als nur durch das Manipulieren der Zinsen. Dabei kann gerade eine Koordination der Geld- und Fiskalpolitik viel bewegen, vor allem, weil sich kein Zusammenhang zwischen dem Verlust der Unabhängigkeit der Notenbank und der Inflation feststellen lässt, so die Autoren in einem Überblick über die einschlägige Fachliteratur. 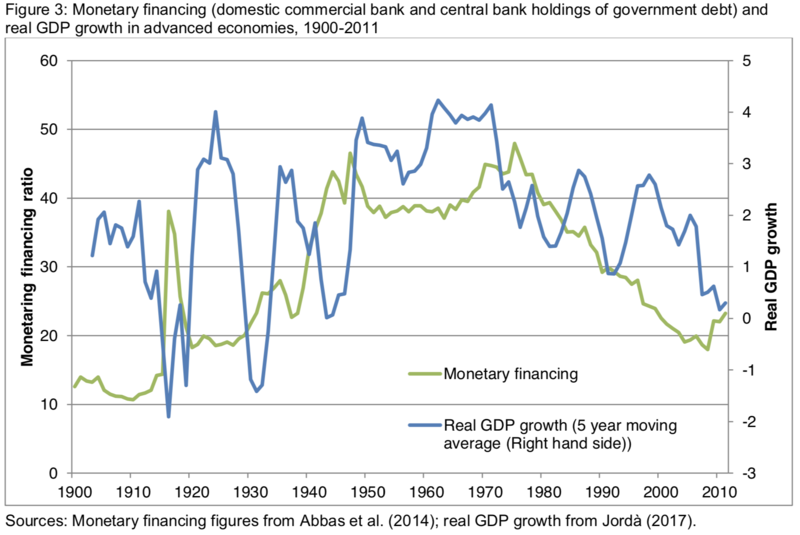 „(…) for long periods of the 20th century, in particular the 1930s-1970s period, there is clear evidence of fiscal-monetary policy coordinationwhereby both central banks and commercial banks were required (covertly or overtly) to purchase government debt to support fiscal policy objectives (including economic growth and debt sustainability). And even where the majority of monetary financing involved the purchasing of assets on secondary markets, this can still be seen as a form of indirect – or ‘two-step’ – monetary financing. This is because it will affect the demand for and yield on government debt, and reduce the net debt servicing burden of the government. 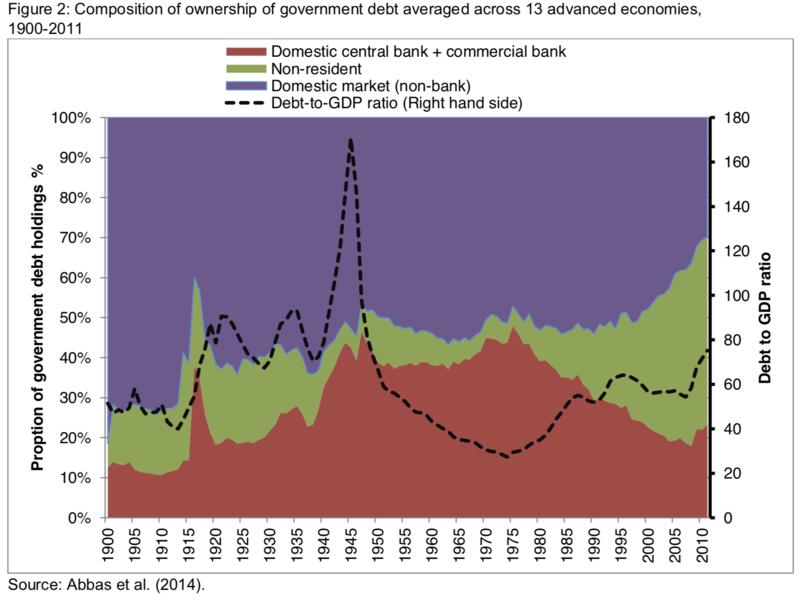 It is also worth noting that up until the 1990s, over 50% of larger commercial banks were, in fact, state owned, making their lending policies more aligned with government economic policy generally.“ – bto: Es ist klar, dass es hier eine sehr enge Beziehung gegeben hat und eigentlich auch wieder gibt. Was bei den Autoren zum Fazit führt: „For most of the 20th century, large quantities of government debt were funded by monetary institutions, but there is little evidence that this led either to misallocation of capital and hence low growth or dangerously high levels of inflation.” – bto: Wir haben natürlich auch noch das Problem der Vermögenspreisinflation, die nicht in der Studie berücksichtigt wird. Ohnehin kann man fragen, ob die Konsumentenpreisinflation der richtige Maßstab ist. „When President Roosevelt came to power in 1933, he used the RFC to support his New Deal policies, creating public credit for infrastructure, machine-tool design machinery, manufacturing and agriculture, expanding the powers of the RFC to incorporate lending to industry (Freeman 2006). Between 1933-45, the RFC lent $33 billion (over $1.2 trillion in today’s dollars), making it the largest lending institution in the world at the time. (…) However, the establishment of the RFC coincided with another important piece of legislation: The Banking Act of 1932. A primary provision of the Act was to allow the Fed to use government securities as collateralfor Federal Reserve notes (on top of gold and commercial paper).” – bto: Die Finanzierung des Staates wurde also offiziell ermöglicht. „(…) the Federal Reserve began purchasing government securities from the open market. The programme was not only expansionary, but was unprecedented in terms of scale and scope, amounting to roughly 15% of the monetary base and 2% of GNP. (…) Indeed, minutes taken from Federal Reserve Board meeting in April 193316 indicate that under President Roosevelt the Federal Reserve Board voted to conduct open-market purchases in 1933 for the primary purpose of lowering the government’s debt servicing costs.“ – bto: genau also das, was wir auch in der nächsten Phase der Krise sehen werden. Ja, das gab es dort schon früher. So gesehen darf es nicht wundern, wenn die Japaner in die gleiche Richtung wieder unterwegs sind. „One of the most successful examples of direct debt monetisationwas the Takahasi government in Japan in the 1930s. Following the abandonment of the Gold Standard in 1931 and the resulting devaluation of the yen, the Takahasi administration embarked on a massive fiscal expansion that reflated the economy out of the Great Depression. The expansion was largely funded via central bank money creation. In November 1932 the government began to sell entire issues of its deficit bonds directly to the Bank of Japan rather than private institutions. Inflation and excess liquidity were then controlled by the Bank of Japan selling government bonds onto the open market. Central government spending rose from ¥1.42 billion (10.7% of GNP) in 1931 to ¥2.25 billion (14.7% of GNP)in 1933, a level at which it remained fixed, expanding the deficit from a 0.1% of GDP surplus to a 6.1% deficit.” – bto: wie sich die Zeiten doch ähneln. Dass es diesmal nicht so gut klappt, sollte eine Warnung für uns sein. Heute haben wir nämlich den demografischen Gegenwind, was es eben ein echtes Ponzi-Problem macht. Damals hat es gewirkt: „By 1933 Japan had emerged from the Great Depression and there was no significant inflation; by 1934 it was moving out of trade deficit into surplus. Inflation began to build up in 1935 and Takahashi reduced government spending, especially military spending, to rein it in and sterilised his previous budget deficits by selling bonds back into the open market.“ – bto: Erst danach kam es zu einer Übertreibung, nachdem Takahasi ermordet wurde und der Nachfolger das Militär großzügig mit frischem Geld finanzierte. So geht es natürlich auch: Man schreibt den Banken einfach vor, einen bestimmten Anteil in Staatsanleihen zu halten (oder ermuntert wie heute in der Regulierung): „A third version of monetary financing is for governments to borrow directly from private banksin much the same way that households and businesses do today.Given that sovereign states with their own currencies and central banks do not, in practice, default (as central banks can create currency ex nihilo), governments should be in a position to issue long-term loan contracts at very low rates of interest; alternatively, states could simply force private banks to accept the loan issued at a maturity and rate of the government’s choosing. During and post-World War II a number of governments engaged in this practice, including the US, (…) Canada); and the UK. In the UK, the Treasury, following Keynes’ advice, forced banks to buy Treasury Deposit Receipts (TDRs) at 1.125% interest to help finance World War II.“ – bto: Und auch nach dem Krieg gab es noch lange Vorschriften, die eine Anlage zu negativem Realzins, financial repression, durchsetzte, um die Schulden zu entwerten. „A number of economists have argued that central banks’ QE policies would be effective at stimulating demand if they committed to permanently monetising a proportion of their asset purchases: the so-called helicopter drop. (…) Since central banks with sovereign currencies cannot default, the choice of whether to monetise becomes essentially a political-economy question.” – bto: Und deshalb wette ich darauf, dass diese zu gegebener Zeit mit “Ja” beantwortet wird. „Our examination of historical trends and case studies suggest that monetary financing was an effective toolin supporting standard macroeconomics policy goals such as nominal GDP growth and industrial policy without excessive inflation. (…) None of this is to deny that under certain other conditions it is possible that monetary financing will lead to inflation. However, our evidence suggests the reasons for this may not be those suggested by the rational expectations models featured in New Consensus economic theory which have an overly deterministic view of the relationship between monetary financing and inflation and rest on a faulty understanding of the role of commercial bank credit creation. Weak governance and tax-raising powers, corruption and war, loss of control over exchange rates or bottlenecks where the economy is at full capacity may be stronger candidates to explain extended periods of inflation or hyperinflation.“ – bto: Das Umfeld hoher Schulden und die Demografie gepaart mit der Globalisierung der (Arbeits-)Märkte und der Automatisierung können auch künftig die Inflation in Zaum halten, egal was die Notenbanken machen. Allerdings dürfte sich die Vermögenswertinflation beschleunigen. „(…) in most advanced economies today there are legal and constitutional impediments to governments considering borrowing directlyfrom central banks for extended periods. The rationale for this should perhaps be scrutinised as part of the wider re-examination of monetary and macroeconomic policythat now appears to be under way in the post-crisis period, when central banks have been unable to stimulate aggregate demand or inflation using adjustments to interest rates.” – bto: was – wie gesagt – gerade auch in Europa passieren wird. „In the shorter term, however, governments could consider debt monetisation via borrowing directly from private banks at below market interest rates, for which there are no legal or constitutional barriers. Monetary financing may provide greater fiscal autonomy to governments, not least in the Eurozone, whose debt may be subject to speculative attacks and/or who find it increasingly challenging to increase deficits or raise taxes from a political economy perspective.“ – bto: Bingo! Tja, das Helikoptergeld wird nur kein Problem lösen, sondern den Crash etwas verzögern. Insofern ist das keine Lösung – die Fallhöhe wird weiter erhöht. Deshalb kann ich die Sympathie für Helikoptergeld nicht nachvollziehen. Die Konstruktivisten sind weiter am Werk, die Planwirtschaftler, die Gottspieler. Das wird in die Hose gehen. Aber das kümmert motivierte Konstruktivisten nicht – die Hybris ist so stark, der Glaube so ausgeprägt, der Vektor der Motivation so einseitig, dass es der Aufbruch ins Verderben ist. Es soll nur niemand sagen, dass er das sich etablierende totalitäre System, was dahinter lugt, nicht hat sehen können. „Davon haben wir nichts gewußt!“ Ich höre schon deutlich die laute Abwehr des Verantwortungtragens. Den Dreh mit dem Helikoptergeld stellen wir uns zu leicht vor, weil private Überschuldung nicht auf diesem Weg gelöst werden kann und die Privaten sind der Schlüssel in dieser Schuldenrkise…die Eigentumsökonomik bezieht sich zu 100% auf privates Engagement, denn Staatswirtschaft scheitert. Wo bleibt Ihre Variante von „Ceterum censeo Carthaginem esse delendam“? Ich fand die Idee klasse. Von mir aus verreckt Alles! @guguk: Bitte ersparen Sie uns anderen Lesern und Foristen solche destruktiven Beiträge. Sie führen nur dazu, dass Herr Dr. Stelter irgendwann eine Freischaltfunktion wie bei den großen Medienportalen einführen muss oder gleich gar die Kommentarfunktion sperrt. Wollen Sie das? 1930 bis 1970 inkl. schmerzvoll langsamer Erholung aus der Grossen Depression und auf Zerstörung ausgelegter Kriegswirtschaft soll eine ökonomisch ERFOLGREICHE Zeit gewesen und somit REALWIRTSCHAFTLICHE Referenz für HEUTE sein können? Hier wird Helikopter-Geld mit Demagogie verkauft. – bto: und das vor dem Hintergrund eines Booms, getrieben aus Basisinnovationen und Bevölkerungswachstum. Was zur Frage führt, ob es in einem gegenteiligen Umfeld auch so funktioniert. Ob es zudem wirklich der Treiber hinter Innovationen war, kann auch gründlich hinterfragt werden. Die die mit Helikopter-Geld auf lange Zeit finanzierte Fiskalpolitik soll dafür sorgen, dass die Ressourcen in den PRODUKTIVSTEN Bereichen der Wirtschaft eingesetzt werden. Denn damit kann man allenfalls Nachfrage generieren und – immerhin – Vollbeschäftigung schaffen mit einem davon abgeleiteten entsprechenden Ressourceneinsatz. „am produktivsten“ erfordert Markt und Wettbewerb – und zwar OHNE Fiskalpolitik. Ersten wird unterschlagen, dass dann die Banken ihre Kredite an den Staat mit Eigenkapital unterlegen müssten, weil sie das bei Krediten an den PRIVATEN Sektor erforderlich ist. Zweitens können Staaten auch dann pleite gehen, wenn sie eine unabhängige Zentralbank haben. Siehe wieder einmal Argentinien (ohne IWF). Die Tatsache, dass Zentralbanken nicht pleitegehen können, erlaubt es nicht, die Staatspleite auszublenden und damit der Fiskalpolitik einen Freibrief auszustellen. Sie erlaubt allenfalls die Schlussfolgerung, dass der Staat nicht illiquide werden kann. Um die Staatspleite auszuschließen, MUSS man die Märkte eliminieren. Eine Zentralbank kann das nicht auf ewig. Wer kein Geld hat, aber Bedarf, der kauft vielleicht mit Helicopter-Geld. Wer keine Bedarf hat, der kauft sich davon Gold und Silber. Auf jeden Fall wird Helikoptergeld einen begrenzten Aufschwung initiieren und keinen nachhaltigen. „Auf jeden Fall“ ist auf jeden Fall nicht korrekt, denn es hängt ganz davon ab, ob die Mehreinnahmen bei den Unternehmen zu Ersatz- und/oder Erweiterungsinvestitionen eingesetzt oder aber ins Assetuniversum geschossen werden. Auf staatlicher Ebene kommt es darauf an, ob die Steuermehreinnahmen für investive oder aber mal wieder nur für konsumtive Zwecke verwendet werden. Siehe hierzu auch die Antwort von Dietmar Tischer an Wawaran weiter unten. Gelddrucken schafft kein nachhaltiges Wachstum, schon gar nicht unter heutigen ökonomischen und demografischen Bedingungen. Die globale Entschuldung ist nicht ohne Schmerzen zu erreichen. Wer etwas anderes glaubt, ist Opfer eigenen Wunschdenkens oder von Demagogie. Helikoptergeld wird einer mit ZIRP und QE nur noch mühsam aufrecht zu erhaltenden Solvenz-Illusion bestenfalls eine hübsche Nachspielzeit bescheren. Wenn es gut läuft. Wenn es weiterhin ein koordiniertes Vorgehen von Regierungen und Notenbanken gibt, und damit die Kontrolle über die Wechselkurse. Das wird hier anscheinend immer stillschweigend vorausgesetzt. Ich frage mich, unter welchen Bedingungen aggressives Gelddrucken nicht doch erfolgreich sein könnte – nicht für alle gleichzeitig – aber vielleicht für eine einzelne Volkswirtschaft auf Kosten der anderen ? Was wären die Voraussetzungen dafür ? Sicherlich eine Währung, die man selbst drucken kann, am besten die Weltleitwährung. Hilfreich auch die Unabhängigkeit von Energieimporten, ein hoher Ölpreis, der Abbau nutzloser Militärpräsenz und Umleitung der frei werdenden Ressourcen in die heimische Industrie und die Errichtung von Schutzzöllen, um konkurrierende Exportweltmeister auf Distanz zu halten ? Völlig abwegig. Oder ein interessantes Szenario für Think Tanks und Spieltheoretiker ? Siehe hierzu meine Antwort an waltomax weiter oben. Das ist korrekt. Die Frage ist allerdings, ob wir mit Analgetika arbeiten (insbesondere Erbschaftssteuer und Helikoptergeld) oder aber „Gottes Willen“ geschehen lassen. „Was wären die Voraussetzungen dafür ? Ja, da ist der Spielraum deutlich größer als bei Nicht-Reservewährungen, zumal die problematischen Schulden in den Nicht-Reservewährungsländern überwiegend auf Dollar und/oder Euro lauten. @Stöcker: Das Thema Erbschaftssteuer halte ich für völlig überflüssig. Wir haben einen Staat der die Sozialabgaben bei 4.500/6.500 Brutto deckelt, ein Winterkorn (er war Angestellter) war mit um die 20.000 € im Jahre dabei – das ist extrem unsozial. Sozial wäre z.B. eine staatliche Grundrente, die inzwischen ja jedem zusteht, egal welcher Name nun drauf steht – im Gegenzug Soz.vers. Beiträge runter, mehr Grundfreibeträge … . Wenn heute von den ersten verdienten 1000 € 40% Sozialabgaben abgezogen werden (incl. Arbeitgeberbeitrag) ist das merkwürdig – dafür lieber 25/30% Umsatzsteuer. Damit hätten Sie das Thema Erbschaftssteuer sauber mit im System. Wer das Erbe nicht verprasst sollte nicht besteuert werden (insbesondere Firmeninhaber) und wer sein Erbe ausgibt, wäre mit der Umsatzsteuer ausreichend besteuert. Womit sollten ggf. die BMW-Erben zahlen? Sie haben auf dem Papier Mrd., nicht wirklich verfügbar. Dank Draghi können Sie damit als Sicherheit bestimmt einen fetten Kredit mit geringen Zinsen bekommen. Aktuell kassieren die Eigentümer 5% Dividende. D.h. vom ausgeschütteten, VERSTEUERTEN Firmengewinn zahlen Sie zusätzlich ihre ZAST – d.h. der Staat hat rund 45% vom Gewinn einkassiert. Von den 55% die über bleiben sind nach Umsatzsteuer (19% bedeutet 15,96% USt Anteil) 40% über. D.h. von 100 € Gewinn bei BMW landen „verkonsumiert“ fast 60% in der Staatskasse – das sollte ausreichen. Staatsfinanzierung: Diese Zwangs-Staatsfinanzierung via Banken hat was, sieht halbwegs „sauber“ aus UND der Staat würde den Pleite-Banken auf diesem Weg zu Einnahmen verhelfen. 30 Jahre 1% ohne Tilgung, ohne Pflicht zur Hinterlegung von Eigenkapital, nehmen wir einfach 2.000 Mrd. € – würden den eingebundenen Banken 20 Mrd. Profit bringen und die Jungs würden bestimmt die 600 Mrd. gedanklich gleich als Einnahme verbuchen. Somit sollte es Pflicht sein, die 20 Mrd. direkt als Eigenkapital in die Bilanz zu packen – sonst werden die ja nur wieder als Boni verschleudert. Das geltende Erbschaftssteuerrecht verstößt aufgrund der unterschiedlichen Behandlung der Erbschaftsobjekte mAn gegen Art. 3 GG. „Womit sollten ggf. die BMW-Erben zahlen? Von daher haben in meinem Modell die Erben ja die freie Wahl: Wer finanziell überfordert ist oder seine Liquidität nicht angreifen möchte, der überträgt seinen steuerpflichtigen Erbteil an einen staatlichen Erbschaftsfonds. Dieser Fonds hält ausschließlich die Assetanteile, hat aber KEIN Mitspracherecht. Die Erträge dieses Fonds (Dividenden und andere Formen der Gewinnausschüttung sowie Erträge aus Firmenverkäufen) fließen in den Staatshaushalt. Es kommt also keinesfalls zu einer Zerschlagung von gesunden Unternehmen oder gar einer Zwangsverschuldung der Erben. Es bleibt de facto alles beim Alten, außer bei der Vermögenskonzentration. Beim Thema SV-Beiträge und Grundrente: D’accord. Statt höherer Umsatzsteuern plädiere ich für höhere Energiesteuern auf fossile Energieträger und Atomenergie. „Die Erträge dieses Fonds (Dividenden und andere Formen der Gewinnausschüttung sowie Erträge aus Firmenverkäufen) fließen in den Staatshaushalt.“ –> Was wird denn der Staat, also die Politik Sinnvolles für die eigenen Bürger mit dem Geld anstellen? Was stellt denn die Politik derzeit mit den Unmengen an Geld für die eigenen Bürger, also für die, die das Geld erarbeiten an? Sie investiert weder in Bildung, noch in Infrastruktur. Die Politik verschenkt das Geld rechtswidrig an illegal Hereingelaufene und in alle Welt. Das eigene Land lässt sie absichtlich (!) verfallen. Meinen Sie, daran ändert sich etwas, wenn diese Politik, die international(sozial)istisch agiert, noch mehr Geld in die Hände bekommt? Es ist auch jetzt schon mehr als genug Steuergeld in den Händen dieser Politiker. Sie setzen es nur nicht zum Wohle dieses Landes und seiner Bürger ein. Das ist das Grundübel. Nicht der Umstand, dass kein Geld da wäre. Die Steuern auf die für unseren Wohlstand essentiellen Energieträger sollten nach meiner Meinung möglichst hoch und möglichst schnell eingeführt werden. Wir brauchen schließlich einen Sündenbock für den wirtschaftlichen Niedergang in Deutschland. Da bieten sich die Öko-Klima-Fuzzies ohne physikalische Bildung doch gerade an. Wenn es dann im nächsten Jahrzehnt noch zu einer völlig natürlichen abrupten Abkühlung des Klimas wie im „Jüngeren Dryas“ (vor ca. 13000 Jahren) oder bei der „Misox-Schwankung“ ( vor ca. 8000 Jahren) kommt, haben wir es geschafft, dass keiner mehr diesen Klimaastrogen Glauben und Geld schenkt. Somit hätte die Krise auch etwas Positives (i.e. Entfernung des Ökosozialismus). Leider wird durch diese seltsamen Klimaprognosen auch die seriös arbeitende Wissenschaft komplett diskreditiert. Aber: Selber schuld, wenn sich keiner wehrt! Es gibt in der Klimageschichte keinen Beweis für eine durch CO2 verursachte Erwärmung. Dazu haben Sie selber einen Vortrag von Bodo XY zitiert, nach dem in der Vergangenheit immer erst die Temperatur gestiegen ist und erst als Folge davon die CO2-Konzentration (Henry-Konstante). Dagegen gibt es für eine durch Erwärmung ausgelöste abrupte Abkühlung des Klimas Beispiele aus der Vergangenheit. Schon mit dieser Aussage schießen Sie sich selber ins Aus. Ja, ich habe Dr. Bodo Wolf zitiert. Aber Sie haben anscheinend seinen Vortrag NICHT gelesen oder aber NICHT verstanden, da Sie ja bei diesem Thema einem gefestigten Credo zu folgen scheinen. Bei Wolf spielt nicht das CO2 die entscheidende Rolle, sondern die Summe der ZUSÄTZLICH freigesetzten Wärme. Damit ist auch die C02 neutrale Atomenergie mitverantwortlich für die Klimaerwärmung. Nachhaltig klimaneutral ist demzufolge nach Wolf ausschließlich die solare Kreislaufwirtschaft. Haben Sie dazu konkretes Zahlenmaterial oder nur so ein Bauchgefühl. Im Übrigen würde die Bereitstellung des wachsenden globalen Bedarfs an Primärenergie durch Solar-Energie diese Problematik (falls der Effekt wirklich signifikant sein sollte) aufgrund der niedrigen Wirkungsgrade dieser Technologien eher verschlimmern. Die maximalen Wirkungsgrade von Photovoltaik-Modulen sind bei optimalen Bedingungen (Lichtintensität, Temperatur der Zellen) im Bereich von 20%, der Rest wird zu Anergie. Außerdem erniedrigt man die Albedo auf nahezu null, wenn man z.B. die Wüsten ( Albedo = ca. 30% des Sonnenlichts) mit Photovoltaik-Modulen zupflastert, d.h. 30% des Sonnenlichts werden nicht mehr ins Weltall reflektiert sondern tragen zusätzlich zur Erwärmung der Erde bei. Es ist also ein Märchen, dass die sogenannten erneuerbaren Energien das Klima nicht verändern würden. Wenn man das Entropie-Problem lösen will, kommt man um den Einsatz der Kernenergie nicht herum. Nein, ich habe hierzu keine Zahlen und mir fehlt auch das fachliche Wissen für eine fundierte Einschätzung. Aber Wolf ist sicherlich aufgrund seiner Ausbildung und Karriere sowie seiner zahlreichen Patente eine ernstzunehmende Persönlichkeit: https://www.wiwo.de/technologie/gruene-pioniere-der-oeko-oelbaron/5154382.html. Hier noch einmal der Link zum Vortrag von Wolf vom April 2018: https://leibnizsozietaet.de/wp-content/uploads/2017/12/Thesen-_Energiewende-2.0_end.pdf (Seite 41 bis 47). „Unfortunately, economics lacks fresh thinking—groping in understanding, deflationary in mindset, atavistic in morality-of-debt thinking. Fortunately, a conference in Washington, DC tomorrow offers an opportunity to set the record straight. Let’s pre-empt therefore five messages on public debt that ought emerge from this conference. First, public debt need never be repaid. Second, a 60% debt-to-GDP target is unnecessary, and for the public misleading. Third, public debt reflects private savings. Fourth, the complete, consolidated state balance sheet matters. Vor Ort gibt es auch den Link zur IMF Konferenz mit allen Videos und Papers (Charles Wyplosz, Barry Eichengreen, Carmen Reinhart, Ken Rogoff, Ricardo Hausmann et al.). Der ewige Traum der Monetaristen durch Geldschöpfung Investments so zu treiebn, dass mehr herauskommt als hineingesteckt wurde. Nun haben doch die Austrians nachgewiesen, dass das durch die dann erfolgende Verzerrung der Produktionsstruktur und Erwartungshaltung der Unternehmer, niemals möglich sein kann. Es kann niemals mehr produziert werden als durch reale Ersparnis möglich ist. Interessant, dass die meisten Börsenprofis wie Stelter, Müller etc. daran immer noch festhalten. Vermutlich, weil sie selbst an dieser Illusion, an dieser Alchemie, verdienen. „Seitdem die Einlösungspflicht des Zentralbankgeldes in Gold- oder Silbermünzen aufgehoben wurde, handelt es sich aber beim Zentralbankgeld um eine „ewige“ Schuld, die die Zentralbank nie einlösen muss. Die Zentralbank zahlt (in der Regel) auch keine Zinsen, weil die Zentralbankschuld ja für die Banken − und, wenn sie in Banknoten eingelöst werden, auch für das Publikum − Geld darstellt. Wenn ALLE Ressourcen einer Volkswirtschaft beschäftigt sind, kann nicht mehr produziert werden. Mehr Geld und folglich mehr Nachfrage bedeuten mehr Inflation, wenn bereits alle Ressourcen einer Volkswirtschaft an der Wertschöpfung beteiligt sind. Wenn noch nicht alle Ressourcen eingesetzt sind, kann durch GELDSCHÖPFUNG – sei es durch Kreditvergabe im Schuldgeldsystem, sei es durch Helikopter-Geld – die Wertschöpfung in der Volkswirtschaft erhöht werden. Es kommt nicht auf die realen Ersparnisse an. Das ist meistens der Fall, weil die westlichen Volkswirtschaften schon jahrelang kontinuierlich unter ihrem Potenzialwachstum operieren. Es gleichwohl nicht immer der Fall, siehe zuvor.